The final fixture of the Suffolk Winter XC League at Haverhill on Sunday saw three Newmarket Joggers secure top positions in their individual age categories in their required four best races from the six fixtures. Neil Pollard (MV40), Neville Clarke (MV65) and Malcolm Osbourn (MV70+) all topped their age groups while Greg Davis (MV55) and Jenny Osbourn (FV70+) were runners up. Pollard, already with 3 straight category wins to his name, needed to stay ahead of Jim Last of Framlingham Flyers in the final fixture to be absolutely sure of top position in MV40. He did just that by coming home in 3rd overall position in a time of 30:00, narrowly ahead of 5th-placed Last (30:07), on this 5 mile, testing, switchback course around Castle Manor Academy playing fields. Meanwhile, down in Sussex at the Hastings Half Marathon, Martyn Taylor (1:27:21) was in full swing, coming home 65th of 2,598 runners overall and 36th of 705 in his MU40 category in his first half marathon race since 2017. A bit nearer HQ, Sara Brown (2:18:07) put in a good effort in the Colchester Half Marathon, while in the King’s Forest 10K trail run at West Stow, Andrew Taylor (48:40) did well over dry, leg-sapping, sandy paths to come 14th of 186 finishers overall. 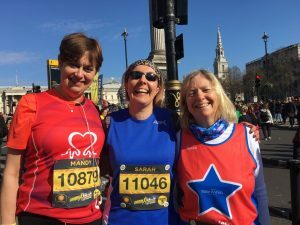 In the London Landmarks Half Marathon, Mandy Davis (2:26:29), Clodie Rolph (2:27:34), Sarah Kinston (2:33:50) and Jan Holmes (2:33:51) all enjoyed perhaps slightly more leisurely runs, no doubt taking in the sights of the capital on the way round and absorbing the fun atmosphere generated among the 13,000 charity fundraisers. 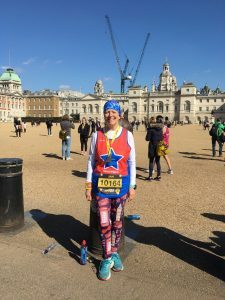 Jan Holmes in London Landmarks HM (photo credit to Jan Holmes). Mandy Davis, Sarah Kinston and Jan Holmes (photo credit to Jan Holmes). Moving up in distance a notch, Paul Dockerill (2:25:26) and Ruth Eberhardt (2:58:02) both tackled the Wymondham 20. Dockerill finished 42nd of 401 runners overall with a 20 mile PB by over 3 minutes, while Eberhardt finished 41st of 182 female runners, which will be excellent preparation for her first ever marathon run in London next month. Also successfully taking on the 20 mile distance were Henry Hamilton-Gould (2:35:15) and Jonathan Ollington (2:54:27) in the Oakley 20 near Bedford, where Hamilton-Gould was 13th of 62 in MV35 and Ollington 37th of 71 in MV50.